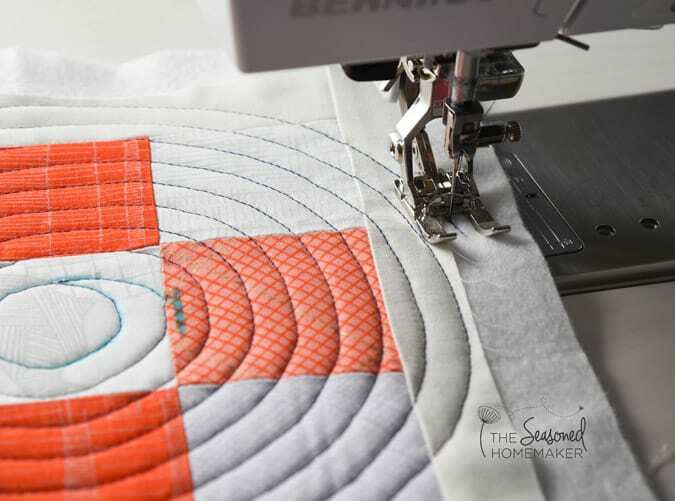 Are you new to machine quilting? You may have made tied quilts for a while and now want to explore machine quilting. I’ve seen a lot of advice given for how to machine quilt but I think most of it lacks a couple of points that are important for successful machine quilting. If you are having some issues or maybe just don’t know what needle to use, these can help. I’m going to give you 16 tips for straight line machine quilting. However, if you are especially having problems with puckering or tucking on the backs of your quilts or skipped stitches on the tops of your quilts, there are easy solutions to these problems in the following tips. 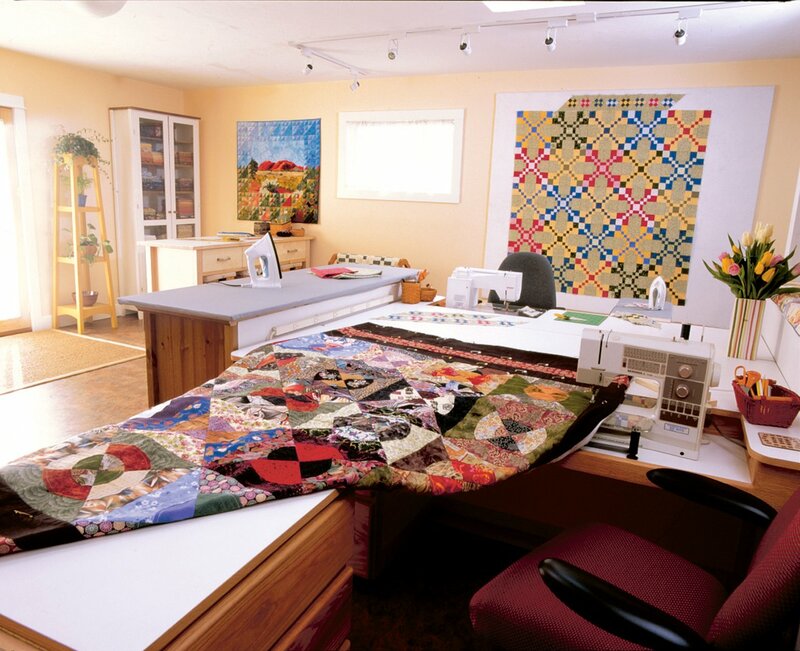 Having enough room to work is one of the keys to successfully quilting on your home machine. Many manufacturers offer drop-in tables that allow your machine to sit flush with the work surface. With so many choices for threads and needles, here’s a general rule: use a size 80 needle with size 40-50wt thread, and a size 90 needle with a 28-30wt thread. Choose needles labeled as sharps, topstitch, or quilting over universal. These needles have sharp tips and will more easily pierce through all three layers of a quilt. 3) Use the same color on top and in the bobbin. 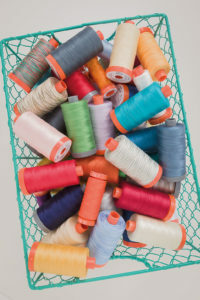 With perfect tension, you should be able to use any combination of colors for the top and bobbin threads, but in reality, this is not always the case. If the two threads have high contrast, you may see little dots of thread either on the front or back of your quilt. You can also use invisible thread in the top or bobbin, just not both at the same time. Christa usually pieces and quilts with Aurifil 50wt cotton thread. Warm up before you quilt by sketching your quilting design on a piece of paper or on a photograph or printout of the quilt top. If you understand the flow of the thread path, you can mimic that motion on your actual quilt. 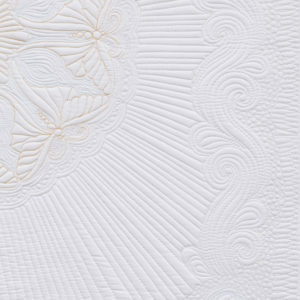 5) Practice free-motion quilting daily. Prepare several practice samples consisting of two 10″ squares with a layer of batting in between. Fill one sample every day and date each sample. Within a week, you will begin to see a noticeable improvement. 6) Embrace the walking foot. Although free-motion quilting allows you to quilt beautiful, intricate designs while stitching in any direction, don’t forget about the designs you can quilt with your walking foot. Instead of stitching in the ditch, try continuous spirals, organic shapes, and gentle wavy lines. 7) Quilt on real quilts, then give them away. Practice makes progress. What better way to learn by practicing on a quilt for someone who will love it and won’t notice the imperfections? Before quilting this butterfly design, Christa made several practice tries. 8) Press seams open for a flatter quilt top. Contrary to popular myth, pressing seams open will not weaken your quilt top. Just lower your stitch length to secure the seams, and you can stitch in the ditch with no problems. Each time you quilt over a seam, it helps strengthen the quilt and you won’t break a needle trying to quilt through lumps and bumps. 9) Take the time to baste properly. I find basting is the least enjoyable part of making a quilt, but it pays off in the end. All three layers should be as smooth and flat as possible. Spray basters can press the quilt on both sides to set the glue; pin basters should double the amount of pins they normally use. 10) Develop a can-do attitude. This is the last–but most important–tip. You only need to work with one-fourth of the quilt under the machine at any one time. Take your time with the process and remember–this is supposed to be fun! 11) Use a Walking Foot. If you’re trying to machine quilt with a regular presser foot, you’re going to have problems. Invest in a Walking Foot (sometimes called an Even Feed Foot) if you don’t have one. A walking foot will make your fabric feed evenly on the top and the bottom, not just on the bottom like a regular presser foot will. There will be no bunching up of the fabric when you use a walking foot. Each manufacturer has a walking foot to fit their machines. 12) Use a Quilting Needle. This makes a difference. Don’t use a Universal Needle, which has a slightly rounded point, for machine quilting. Although it can work just fine and you may not have any trouble, quilting needles are better for machine quilting. Quilting Needles are made for a reason! They have slightly heavier shafts and a sharper point to get through thick layers of batting and intersecting seams. If you are having skipped stitches sometimes, a Quilting Needle can eliminate this problem. It can also help a lot with any tucking or puckering on the back of your quilt. 13) Use a Heavier Needle. 14) Decrease Your Presser Foot Pressure. If your machine has this adjustment, use it. My Janome is set to 5 for regular sewing, but I switch it down to 3 when I start quilting. It makes it easier for the quilt sandwich to move through the machine. This can also help with any tucking or puckering on the back of your quilt. These gloves are grippy and will be a revelation to you if you’ve been quilting without them. They enable you to really firmly hold on to the quilt as you move it through the machine. Plus I believe they help prevent any oils and dirt from your hands in getting on the quilt as you are quilting it. These are the kind I use but there are many different manufacturers. 16) Change Your Needles Often. It’s never good to let your needle get dull. This can cause problems – like skipped stitches – and needles are cheap. Some people change their needles every time they begin a new quilt. These are tips that I feel will help you immensely, especially if you are wondering why you might be getting tucks on the back of your quilt or skipped stitches. Give them a try on your next quilting project. Once you’ve sketched and practiced your domestic machine quilting designs, try them on an entire quilt! 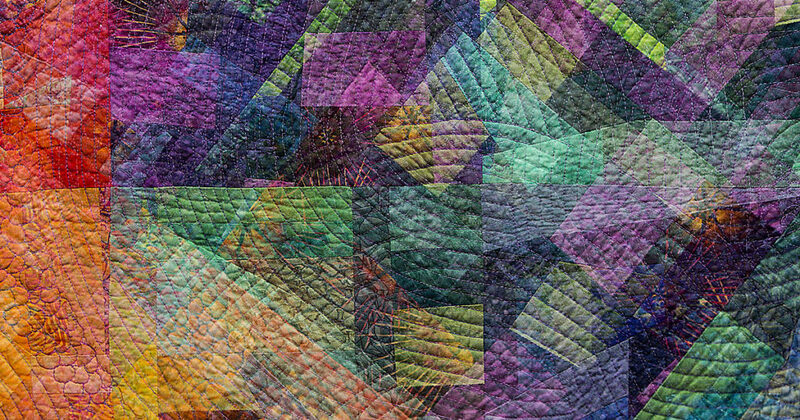 Explore 90 modern quilt designs when you download your Modern Patchwork 2016 Digital Collection featuring all four issues as they were published. You’re sure to be inspired by the projects, articles, and more!